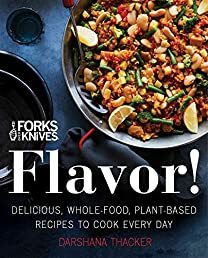 The first four-color Forks Over Knives cookbook: head chef Darshana Thacker offers 150 delicious, all-new, easy-to-prepare whole-food, plant-based recipes for internationally inspired meals. The 2011 documentary Forks Over Knives ignited a revolution, empowering people to live healthier and happier lives. The film revealed the indisputable link between the average American diet—heavy in meat, dairy, and refined foods—and heart disease, stroke, cancer, and diabetes. It also showed how, by focusing on a whole-food, plant-based diet, these chronic illnesses could not only be prevented, but sometimes even reversed. Through its meal plans, website, and New York Times bestselling cookbooks, Forks Over Knives has proven that a diet based on fruits, vegetables, tubers, whole grains, and legumes isn’t just good for you, it tastes good too. Sure to please health-conscious eaters and the most discriminating palates, these oil-free, plant-based riffs on culinary favorites teach readers new techniques and introduce them to heady spice blends and a wide range of ethnic traditions from around the globe. Convenient, affordable, and wildly creative, Forks Over Knives: Flavor! is a must-have for the health-conscious cook. The 21-Day Plant-Based Challenge: 3 Weeks of Menus, Recipes, and Tips to Explore the Plant-Based Lifes..